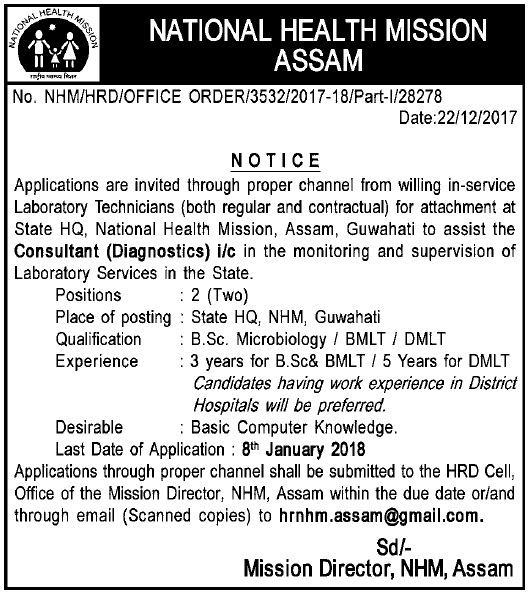 Applications are invited through proper channel from willing in-service Laboratory Technicians (both regular and contractual) for attachment at State HQ, National Health Mission, Assam, Guwahati to assist the Consultant (Diagnostics) i/c in the monitoring and supervision of Laboratory Services in the State. Experience : 3 years for B.Sc& BMLT / 5 Years for DMLT Candidates having work experience in District Hospitals will be preferred. Desirable Conditions: Basic Computer Knowledge. Applications through proper channel shall be submitted to the HRD Cell, Office of the Mission Director, NHM, Assam. You can also apply through email (Scanned copies) to hrnhm.assam @ gmail.com. Last Date to apply: 8th January, 2018. 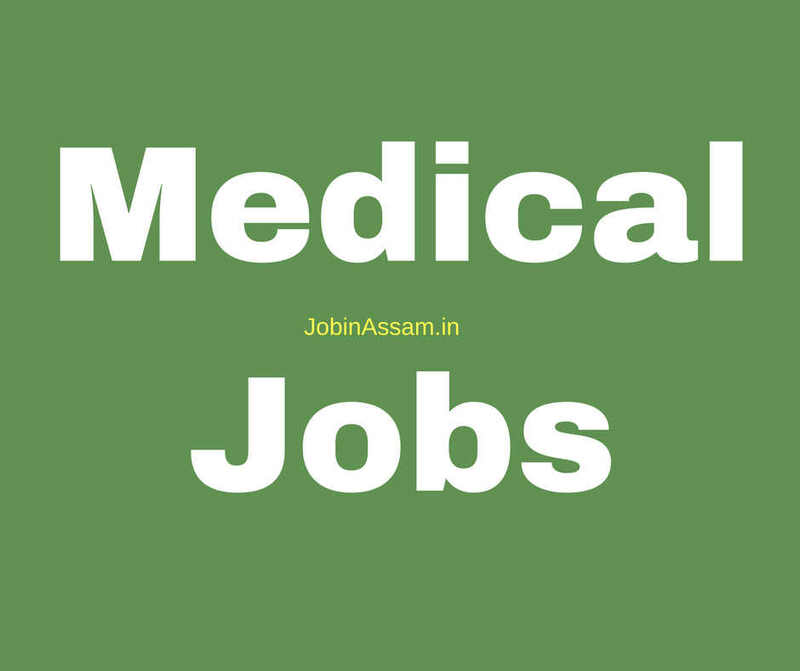 Here is the advertisement details of National Health Mission, Assam Recruitment 2018. Online applications are invited from the candidates willing to work in mission mode for engagement on contractual basis in the following 1121 posts in different programmes under NHM, Assam. The vacancies may increase. Candidates without the following qualification need not apply. MBBS with Post Graduate Degree/ Diploma in Pediatrics from a Govt. recognized Medical College and registered with Assam Medical Council. Desirable : Degree/ Diploma in Public Health Management. MBBS/Dental/AYUSH/Nursing graduate preferably with Masters in Hospital Administration/ Health Management (MHA-full time or equivalent) with 5 years experience in Public Health/ Hospital Administration, out of which, at least 3 years work in the field of quality in health care would be desirable. Training and experience of implementing a recognized quality system like NABH/ISO 9001:2008 /Six Sigma / Lean/Kaizen / NQAS or equivalent would be preferred. Master’s Degree in Management Sciences/ Health Management. Post Graduate Degree in Sociology/ Social Work/ Home Science/ Women Studies/ Public Health from Govt. recognized institution. Retired Additional Chief Engineer (Civil) from any of the works department of Govt. having good knowledge of building works (Execution & Supervision), preparation of estimate for building, national bidding process, building code of practice etc., having sound health capable of traveling within the state. MBA, Post Graduate Degree / Diploma in Management / Rural Management / Social Work / Rural Development from Govt. recognized institution. CA/ICWA/MBA (Finance)/ M.Com with 1 year experience in financial and accounting matters. Or B.Com with 3 years experience in financial and accounting matters. Graduate in any discipline with Post Graduate Diploma in Material Management/ Supply Chain Management/ Logistic Management. Graduate in any discipline. Diploma in Stenography in English from recognized Govt. Institution. Retired Deputy Accountant General (Audit) from the Office of the Principal Accountant General (Audit) or Retired AFS Officers not below the rank of Jt. Director / Sr. Financial Advisor / Joint Director (Audit Service) or Qualified CA with 5 years post qualification experience in internal / statutory audit. M.Sc in Disability Studies (Early Intervention) with basic degree in Physiotherapy (BPT)/ Occupational Therapy (BOT)/ Speech Language Pathologist (ASLP) or Post Graduate Diploma in Early Intervention (PGDEL) with basic degree in Physiotherapy (BPT) / Occupational Therapy (BOT)/ Speech Language Pathology (ASLP). A technical person with 1 Year diploma in hearing language and speech (DHLS) from a RCI recognized institute. The audiometric assistant will provide support to CHC in screening of HI persons. B. Sc. Nursing/ GNM Course passed from any nursing school / institution recognized by Indian Nursing Council and registered with “Assam Nurses’ Midwives’ and Health Visitors’ Council”. MBBS Degree with PG Degree / Diploma in relevant field from a recognized Medical College and registered with Assam Medical Council / Medical Council of India. Candidates have to apply online in the NHM, Assam website: www.nrhmassam.in. Online application will be received till 20/10/2017. The vacancies may increase.